Port Monmouth First Aid On Facebook! 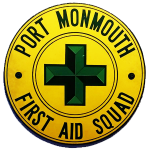 The Port Monmouth First Aid Squad is a nonprofit organization that provides pre-hospital Emergency Medical Services and Rescue Services to the Township of Middletown. Our members run approximately 2,000 calls a year in the 42 square miles we cover. We are comprised of all volunteers, who are on call 24 hours a day, 7 days a week, 365 days a year. Port Monmouth First Aid Is selling Gertrude Hawk Chocolate Bars! Coupon Book Fund Drive In Progress!